Indonesian Murder Suspect Of Kim Jong Un's Half-Brother Freed As Charges Dropped Siti Aisyah of Indonesia was freed Monday after Malaysian prosecutors unexpectedly dropped the murder charge against her. Kim Jong Nam was killed after a nerve agent was spread on his face in 2017. 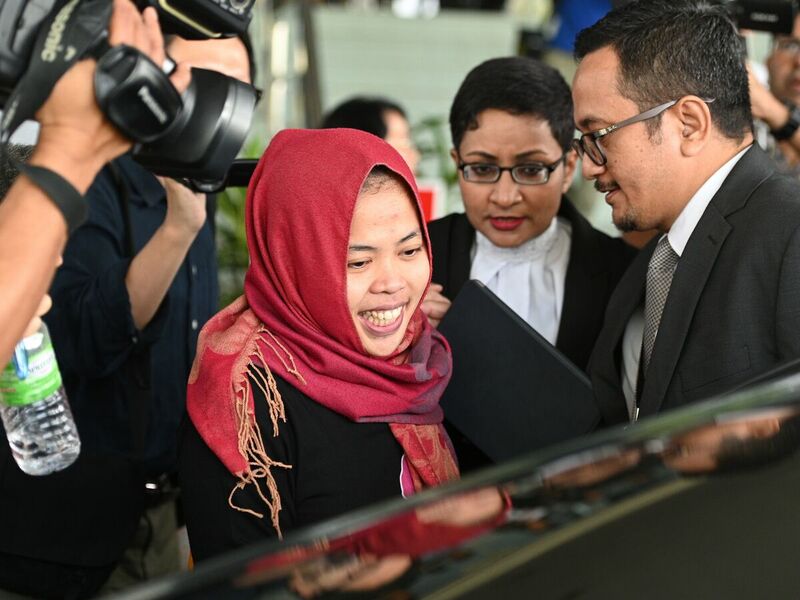 Indonesian national Siti Aisyah smiles while leaving the Shah Alam High Court, outside Kuala Lumpur on March 11. The moment was captured on security camera footage seen around the world. The Indonesian woman arrested in the murder, Siti Aisyah, told investigators she thought she was just participating in a TV show prank. "I am very happy, I did not expect my release," said Siti, according to The Guardian. "This is my day of freedom. Thank you to the Indonesian President Jokowi and the Indonesian ministries and the government who assigned a Malaysian lawyer for me. Thank you to the Malaysian government for releasing me." The Malaysian attorney general personally approved the decision to release Siti, the Guardian reported. A letter approving her release cited "the good relations between our respective countries." Prosecutors in court did not say why they were dropping charges. But according to a foreign ministry statement Monday, Siti was "deceived and did not realize at all that she was being manipulated by North Korean intelligence," the Associated Press reported. The foreign ministry said that Siti's future was discussed in "every bilateral Indonesia-Malaysia meeting." Siti headed back to the Indonesian Embassy, and plans to fly home to Indonesia tonight, embassy officials said. After Aisyah was freed, the murder trial of the other woman in custody was put on hold. "I am in shock," Doan Thi Huong of Vietnam told reporters through a translator, according to the AP. "My mind is blank." Aisyah and Doan had been held for two years on suspicion of killing the man. But they have maintained that they thought they were smearing baby oil on his face, CNN has reported. Aisyah told an investigating officer that she was paid around $100 to take part in various pranks outside a Malaysian mall for a Japanese YouTube show. It took 20 minutes for Kim Jong Nam to die after the banned nerve agent VX was spread on his face. VX is classified by the international Chemical Weapons Convention as a weapon of mass destruction. Malaysian authorities had alleged the two women were trained by North Korean agents. The U.S. State Department determined last year that the assassination was orchestrated by North Korea and carried out with chemical weapons in violation of international law. North Korea denies involvement.